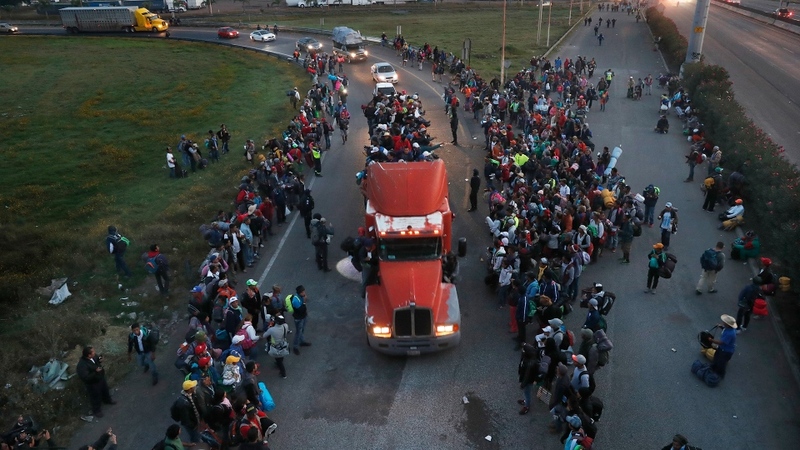 IRAPUATO, Mexico -- Local Mexican officials again helped thousands of Central American migrants find rides Sunday on the latest leg of their journey toward the U.S. border. At a toll plaza to the west of the central Mexico city of Queretaro, where the group spent Saturday night, police prevented migrants from waylaying trucks on their own, but officers did help them find vehicles for rides. The government of Queretaro said via Twitter that 6,531 migrants had moved through the state between Friday and Saturday. It said that 5,771 of those departed Sunday morning after staying in three shelters it had prepared, the largest of which was a soccer stadium in the state capital. Those numbers appeared even higher than counts made by officials when the group was in Mexico City for several days, raising the possibility that other migrants had caught up to the main caravan. 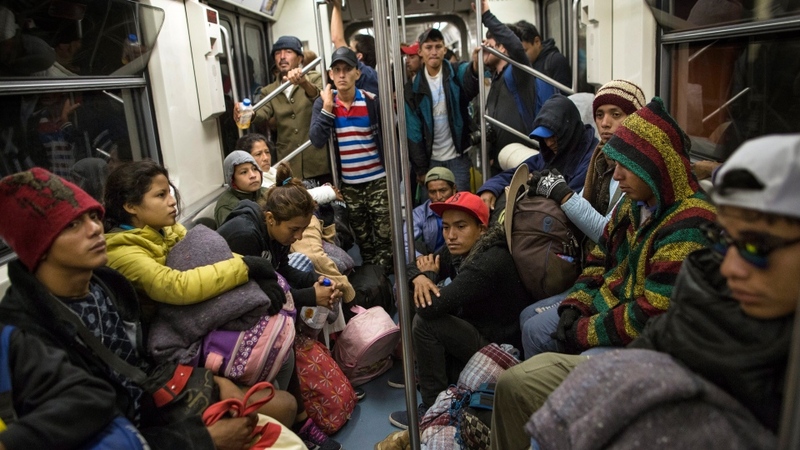 Starting out before dawn, the migrants went on to Irapuato, an agricultural city about 62 miles (100 kilometres) to the west in neighbouring Guanajuato state, and set up camp around a local family centre and small sports complex. As on other days, the migrants jumped at any opportunity to catch rides. They piled onto flatbed trucks, hung from car carrier trailers and even stacked themselves four levels high on a truck that usually carries pigs. Miguel Ortiz of Honduras reclined in the pig trailer with his wife and son. He said they were headed to U.S. for a better life where they could work for more than just putting food on the table. Maria Isabel Reyes, 39, of Honduras travelled with her three daughters and a granddaughter. "I feel happy by the grace of God," she said. "Because we're advancing little by little, but all of us here are moving forward." The migrants appear to be on a path toward Tijuana across the border from San Diego, which is still some 1,600 miles (2,575 kilometres) away. 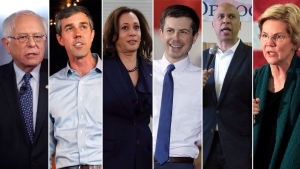 The caravan became a campaign issue in U.S. midterm elections and U.S. President Donald Trump has ordered the deployment of over 5,000 military troops to the border to fend off the migrants. Trump has insinuated without proof that there are criminals or even terrorists in the group. 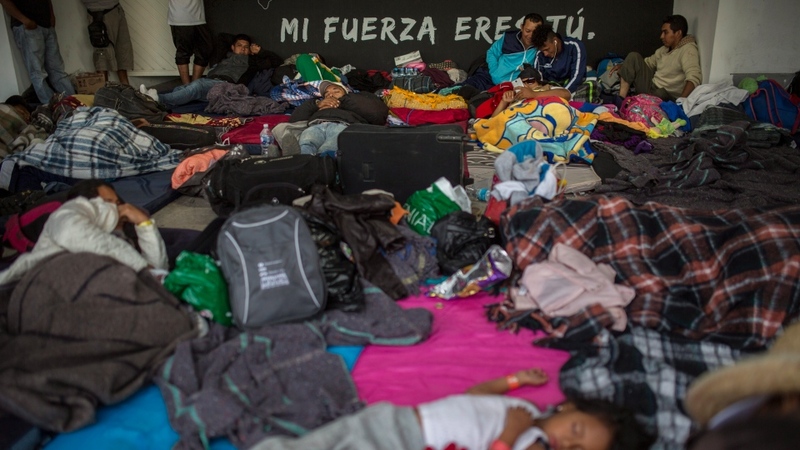 Many migrants say they are fleeing rampant poverty, gang violence and political instability primarily in the Central American countries of Honduras, Guatemala, El Salvador and Nicaragua, and they have now been on the road for weeks. Mexico has offered refuge, asylum or work visas to the migrants, and its government said 2,697 temporary visas had been issued to individuals and families to cover them while they wait for the 45-day application process for a more permanent status. But most vowed to continue to the United States. "We can earn more (in the U.S.) and give something to our family. But there (in Honduras) even when we want to give something to our children, we can't because the little we earn it's just for food, to pay the house and the light, nothing else," said Nubia Morazan, 28, of Honduras as she prepared to set out Sunday with her husband and two children. Associated Press writer Christopher Sherman in Mexico City contributed to this report. Migrants weigh whether to stay in Mexico, resume trek to U.S.